Hi, I’m Stu Harrison and I’m here with Merriam Pianos in Toronto, Canada. And today we’re talking about baby grand pianos. Now this is something that I think is on everybody’s ultimate wish list, for when you get the house with that perfect bay window, or a room that would be ideal to just have a grand piano next to a little fireplace or a study or something like that. And it’s a piano that I get a lot of questions about. People start out on their shopping journeys, they know they want the look, they know they want the piano. But when it comes to actually researching it, there’s a lot that they don’t know. And so when they come in here, I’m usually able to cover five or six topics which instantly clarify a few things. And I thought, why not put that on video? And that’s why we’re here today. So we’re going to be talking about price ranges, we’re going to be talking about finish, we’re going to be talking about the differences between say an $8,000 one to an $80,000 one. We’re going to be talking about what you can expect in terms of how long they last for. We’re going to be talking about how they’re different than an upright. That’s actually something that comes up quite a bit. Maybe some of the brands that manufacture baby grand pianos, what the right room size is for a grand versus a baby grand piano. And of course, whether to look at new or used. Because that’s a question that probably comes up more often than anything. Should I be looking at new, or should I be looking at used? So we’re going to be covering all of those today, and I hope you find it helpful and add to your research and help you make a really great choice when you’re shopping for a baby grand piano. So thanks for joining me. So let’s cover price ranges first, because when you walk into a piano store or you hop on Ebay or Kijiji to try and figure out exactly what price range you should be in, you’re obviously going to see that there is an enormous range of price points. Everything from $5,000 to $6,000 for some used, all the way up to six digits, $100,000, $110,000 for some of these things. And you might be thinking to yourself, why is there such a huge range in these price points? Why is one worth so much and one is worth so little? So let’s, first of all, cover what’s the right expectation for what you’re going to be paying for what you get. And why is there that huge difference in price? Well if you’re looking at used, about the lowest price in Canada that you’re going to be able to find a baby grand piano that’s even remotely in good playable tuneable condition is going to be sitting around that $5,000 price range. I see a few of them pop-up on Craigslist, Kijiji every once in a while. We keep our eye out for them too just in case something interesting pops up that we’d like to have on the showroom. To get anywhere underneath that price point, you’re literally playing with fire. I do find that for people who are reselling instruments privately in and around that $4,500 to $5,000 range is about the lowest anyone will go if they’ve still got a piano that looks good and is playable. In a store, if you’re looking at used, you’re really going to be starting at about $7,000 to $7,500 and up. To get a brand that you’re going to recognize, like a Kawai or Yamaha, you can probably take that up to about $9,000 to $10,000 for used, and up. The majority of used baby grand pianos are going to be running between, for private $5,000 to $10,000, and within a store with warranties where you know it’s really been checked over by a reputable technician, you’re running probably about $7,000 to about $12,000 or $13,000 for a good, pre-owned, baby grand piano. Now for new, the range is massive. You could be looking at anywhere from about $8,000 all the way up to $100,000, although the majority of the selection for baby grands is between about $8,000 to $20,000. Everything over $20,000 and you’re looking at a handmade performance instrument, which can be beautiful for people who are looking for multi-generational investment. Or of course, if you’re a really fine player yourself, you might want to have something like that to have in your home. A great instrument no matter how good a player you are is one of those few things that you can invest in that will consistently put a smile on your face every time you sit down. I know it sounds cheesy, but quite frankly, it’s true. And those who have already made that investment know exactly what I’m talking about. Nothing could be more true. When I invested on my piano in my condo, I spent a little bit more than I was expecting, but every single day I sit down in front of it, literally puts a smile on my face. And I’ve never once looked back and regretted that investment. So again, for new, for the majority of selection, you’re going to be looking at about $8,000 to $20,000. And for something a little bit higher end, you could be looking at $20,000 up to $40,000. And of course, you can go as high as $100,000. Now let’s take a look inside the instrument and talk about maybe why those differences in price exist and why you’ve got some instruments that might last 20 to 25 years while others are going to be lasting 100 to 125 years. There’s several features in the instrument that are going to affect both the longevity and the quality of the sound that you get. So let’s take a peek. One of the most critical parts of a baby grand piano is its structure. And this is something that most people overlook because it looks the same, no matter what instrument you’re taking a peek at. Now when I say the structure, I’m really referring to one component, and that is the rim. Now the piano we’re looking at here is called a Mason Hamlin B, and a lot of people would probably concur that in the world of baby grand pianos, this might just be the finest five foot four baby grand that is currently on the market. The only other one that I’ve caught and consistently heard come up would be the Fatzioli F156, which is certainly a beautiful piano. Mason is always uttered in the same sentence, though, given that the Mason is half to a third of the price of the Fatziolio though, this is quite the steal and it’s a piano that I love having here on the floor. Now the rim of the instrument, and this is true of any piano, is this curved part right around the edge of the instrument. And the part that we see on the top here is partially decorative and partially structural. On the bottom, and we’ll get some footage for you to look at this a little bit later, is the big thick rim that goes all the way around the outside of the piano underneath. It’s what the plate is bolted to, it’s what the soundboard is in direct contact with. And this is what gives the piano its main structural support. You can think of this as the chassis of the instrument. And what the piano is built on is gonna determine a lot of its performance characteristics and certainly its longevity. So generally speaking, the thicker and the more dense the rim of the piano, you’re going to be getting better projection, you’re going to be getting better sustain, and you’re going to be getting better tuning stability, generally across the board. So as your price point goes up, you’re usually getting thicker rims, you’re getting denser rims by increasing the density of the type of wood you’re using, and you’re going to get better sustain and more projection. So a piano like the Mason Hamlin being a five foot four is actually going to produce more sound than a lower class six foot piano because it’s getting so much more energy out of itself because of the thickness and the rigidity of the rim. So the rim is a really critical part of the piano. And you don’t have to dive too deeply down that rabbit hole, but just be aware of it, be appreciative of the fact that this is something that has a huge influence over its performance, its longevity, and obviously its price point. Now the second factor with a baby grand piano that’s going to influence its price range is the quality of the wood that it’s using for the soundboard and bridge material. Now the soundboard is this big white sheet of wood that’s sitting underneath the rim right here. Now soundboard is actually what you’re hearing when you hear the tone of the piano. The strings themselves, if they weren’t connected to the bridge and the soundboard would be so quiet, it would be like listening to an electric guitar not plugged in. You could still hear it a little bit, but it wouldn’t make it more than a few feet beyond the instrument. When you’ve got the soundboard connected to the bridge, and the strings are pushing down on the bridge, that soundboard now starts to vibrate in the same way the string is vibrating and the soundboard becomes a gigantic transducer or in other words, a huge speaker. Just in the way that we’re used to listening to other stereos or radios, which got those cones and speakers going boom boom boom boom, the soundboard is exactly the same thing. But instead of a magnet, we’ve got the bridge. So the type of wood and the quality of wood that a manufacturer uses for both the soundboard and the bridge is going to have a huge impact on the clarity of the sound and the sustain, or how long the sound lasts for. So when we’re talking about an $8,000 piano, we’re going to be talking about soundboard material which is probably fairly easy to get our hands on, such as a Sitka Spruce. We’re going to be talking about a bridge which is primarily just one solid piece of wood rather than laminated, and that wood is going to be a little more rigid, a little less flexible and a little less consistent than a piano at $20,000 which is going to have maybe slightly thinner wood, slightly more consistent grain, maybe dried a little bit better. Might even be getting into laminated bridges at that point. And of course by the time you’ve get up to a really really high-end performance piano, you’ve literally got the perfect combination of exactly the right wood, dried to exactly the right humidity, moisture level, with exactly the right bridge placement. Perfect down bearing, perfect soundboard tension. So the soundboard and the bridge definitely have a huge impact on price because there’s a material cost difference, and there’s also a performance difference as well. There are some other features which have an impact on price, but much less so. I’ll quickly go over them so that you can be a little, just aware of them at this point. You may come across a term called Duplex Scaling, and some manufacturers make really big deal of this, some manufacturers include it and actually don’t mention it at all. It’s something that adds a particular character to a tone, or character to a sound. And it’s important to know that this is not a better or worse thing. 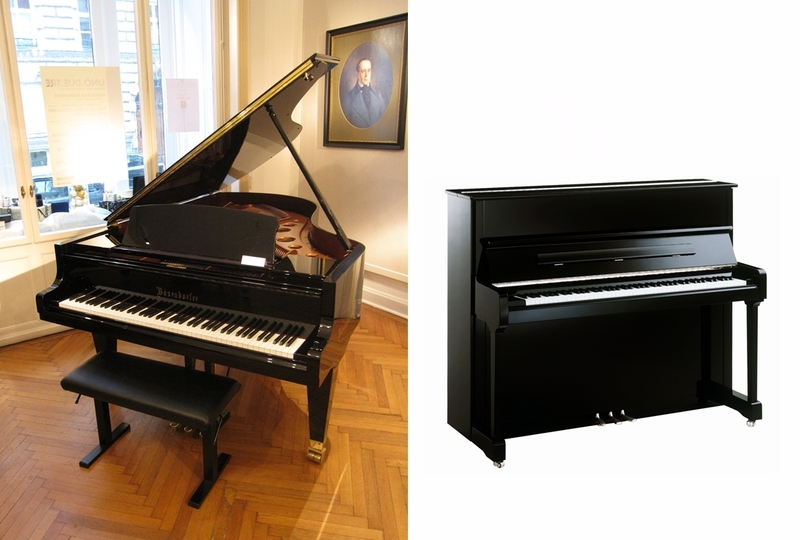 Some of the most expensive, most highly regarded pianos in the world don’t have duplex. On the same token, some of the least expensive pianos in the world put it on. So it’s not necessarily connected to price point, but I think it’s important to just be aware of. And you can see it quite easily when you’re looking at pianos yourself. So I’m going to teach you how to recognize duplex in just a very basic understanding of exactly what it does for the piano. So if you look down in the treble section of the bridge, so that is the shorter sections of the string on any piano, you’ll notice that there’s this piece of wood here that the strings stretch over. Well on the other side of that bridge, you’ll also see here that we’ve got these ridges that the strings are curving over. This section of string is what they call the duplex scale because it’s the second section of string which is able to resonate and ring. And the reason you can tell that it’s there is it creates that section that’s able to ring by putting a little ridge there so there’s a definite point at which the string can resonate versus not. And so if you see these little metal ridges on the treble sections of the piano, you know that it’s got duplex. Now what does duplex do? Well, duplex adds an extra layer of harmonic complexity to the note because it gives all of these extra strings, which are very high in frequency, the opportunity to ring, or to react sympathetically to what you’re doing on the rest of the piano. Some baby grand pianos are going to have this duplexing and some may not necessarily have this duplexing. It really is a matter of preference. And of course, if you’re just a beginner, honestly I wouldn’t focus too much on it. You might enjoy it, you might be able to hear it, you might not. It’s just something generally to be aware of. We also said we were going to talk about the differences between an upright piano and a baby grand piano. There are a lot of families who come in and they’re still in the middle of that debate as to whether to go with a better upright piano or maybe go with a similar but slightly more expensive baby grand piano. And I think they’re worried about whether it’s mostly an aesthetic choice or really trying to understand the differences between those two choices and make an informed decision as best they can. So without getting into too much detail, we’re going to cover some of those major differences right here for you right now. Now the first thing to know is that a grand piano and an upright piano are actually not that much different. As you take a piano apart, either a grand or an upright, you can see a lot of the things in common. The way that the strings are laid out, the solid iron plate, the dampers, you can see the hammers through the strings, and of course, they both have the 88 keys. In fact, if you were to be able to just take this whole plate and soundboard and simply tip it upright and replace the grand action with an upright action, you really wouldn’t have a piano that much different than what an upright is. Essentially an upright is just an upright version of a grand piano. So why do people talk about this huge difference in sound? Cause there definitely is. This is not just stereotyping, grand piano does have a much different sonic response to it than an upright. But this is more of a logistical, practical difference than anything else. See, if we come over and take a look at our upright piano here, and I’ve taken it apart for us so we can see on the inside, we can also see that we’ve got a frame, we’ve got the action, we’ve got the hammers, we’ve got the mechanism down below. But what do we do to upright pianos? Well, we build a box around them, and then we back them into a wall. One of the reasons that grand pianos have this huge sound to them is that the soundboard, which we just talked about where the sound comes from, is suspended in midair. In a sense, it’s able to release sound down to the floor, it’s also able to release sound up into the lid and bounce out. So you’ve got this double sided speaker which is emanating sound in both directions with lots of air to escape and expand into. What did we do with the upright? Well virtually, the exact opposite. Instead of giving lots of room on both sides of the soundboard, we actually close it in as much as possible. So the soundboard at the back has only a few inches for the sound to really expand into, and on the front, we built a nice little box. So one of the first things to realize is that one of the biggest differences in sound between the two instruments actually has very little to do with the structure of the piano, it has a lot more to do with just the tradition and the practicality of how these two instruments have evolved. This has always been about saving space, saving cost, and the sound is just virtually trapped inside most of the time. That’s one of the big reasons why grands have this huge big sound to them. The second reason that there is a difference between a grand and an upright, and this is more of a playing difference than a sound difference, are the actions. And again I’m just going to cover this very, very quickly so we can see. Now I’ve got two actions set up just to the right of me here. A grand piano action is a very different structure than an upright piano action. The grand action is based exclusively on gravity. When I play this action, the hammer is able to just fall back on nothing but gravity. And so no matter how quietly or slowly I play this action, the hammer’s always going to reset itself at approximately the same speed. Now on an upright piano, it’s not just gravity that’s at work. We have to use a spring and what’s called a bridle strap to pull the hammer back. And of course, as we slow down and start playing more and more softly since we can’t rely on gravity as much there’s an opportunity for less control or even missed notes when you’re playing an upright piano. So if you’re talking to maybe a piano teacher or a technician who’s telling you that oh you have a son or daughter, they’re playing at a very high level, you need a grand. And maybe you’re thinking to yourself, well need is a strong word, what exactly do they mean by that? Often time it’s the action they’re referring to. And to be honest, it’s pretty legitimate. If you’ve got a high-end player, who’s already reaching for a level nine, level ten, or beyond, and they’re getting in some pretty intricate music, even if you’re thinking about a baby grand, $10,000, $11,000, $12,000, that grand action is gonna give you more speed and more control than most upright actions are. So we’ve got two big differences between the grands and the uprights. We build a box around the upright, we let the grand out in the open and let the sound expand. And of course, we’ve got our action differences as well. And to be honest, that really are the two big practical differences between the two instruments. The third one, which of course is the unspoken difference is that, let’s be honest, grands look great. And I think one of the reasons that most people want them in the house is that it’s an absolutely beautiful piece of furniture, and it just sets a room off like very few other pieces of furniture possibly could. So the last thing that we’re going to cover are the differences between new and used baby grands. When’s the right time to look at them, and what are some of the risks involved? We sell almost an equal number of used and new pianos here at Merriam. So there is a time and a place for both. So let’s talk about used first. Well, the obvious advantage is that you’re often saving money. And the difference between a used and its equivalent new is often gonna be somewhere between 35-50% less of the equivalent new piano. So if we’ve got a grand piano that’s selling new for $15,000, there’s a very good chance you’ll be able to find a used one for somewhere between $8,000 to maybe $10,000. And that might be anything in the 15 to 30-year-old range. One thing that a lot of people are startled by is how old used pianos often are. When we buy used appliances or used cars, we’re used to thinking about an acceptable range being maybe five years old or maybe at maximum ten. Well quite honestly, ten years old for a baby grand piano that’s well made from a decent brand is young. You’re barely out of the gate for a piano that was designed to last 60, 70 years. So as you’re looking at used pianos, don’t let the age on its own necessarily alarm or dissuade you. 25 to 30 years is a perfectly reasonable age to still be looking at a used piano, as long as it’s maintained well, and as long as you’ve had an opportunity to have a technician look at it, or you’re dealing with a really reputable store. One of the big differences between a new and a used piano is going to be the action component. And I know we were just looking at that a little previously. An action has a lot of moving parts in it, seven or eight moving parts per key in fact. And it gets well into the thousands once you add up the entire action. Regardless of how often the piano has been tuned, regardless of how well the piano’s been maintained and how consistent the humidity, as you play a piano in for 20 or 30 years, those parts do loosen up. And it gives a slightly lighter feel, but if you’re a precision player or particularly if you’ve focused on classical music, sometimes that looser action is gonna become an impediment for you learning how to play some of that higher level music. So if your hobbyist looking for a piano, or if you’re somebody who is not necessarily going through a lesson regime and you really just want it there for fun, in this respect a used instrument shouldn’t really be turning you off at this at all. However if you’re parents and you’ve got a young son or daughter or a teenager who really is starting to get into a higher level of playing, this is something that you really should be thinking about, because a nice, precise, tight action is a mandatory thing for learning high-level music. And that is the difference between new and used. Now the second thing is, as a used piano ages, there are also certain parts of the soundboard that start to decay or deteriorate. Specifically, we’re talking about the crown of the piano. So a used piano will also produce less power than its equivalent new. So if I’m looking at a 20-year-old 5 foot piano, and a brand new 5 foot piano, most of the time, 95% of the time that new instrument is gonna actually produce more sound even though it’s the same size as the used one. So in that respect, the used piano for 50%, 40% less may actually also be giving you 50% or 40% less of the performance. So the value of a used piano may be slightly higher, but it’s not dramatically so. It really is a lot different than a car where even if you have a car that’s been impeccably maintained at 50,000 kilometers, everybody knows that it’s going to be depreciated at a certain point, no matter what. The kilometers dictate the depreciation a lot of the time. And on pianos, even if it’s perfectly well maintained, there’s going to be a degradation of performance no matter what you do because of the enormous tensions on the instrument. So that’s the other big difference with used. Now to go with new, a lot of the time people are surprised at the type of brands you can access without going over the $10,000 range. For example, Kawai has a model that several times a year can be had for a little under $10,000. I know that Yamaha has a couple of models in the same sort of price range. Some of the higher level Samick and Young Chang pianos are also in this price range. Without having to get into some odd, no name, Chinese built pianos, for around the ten mark, you can still get yourself a really reputable brand without having to go used. Most of the higher level performance baby grands are going to start in the $15,000 to $20,000 range. So that is when you have to have a different type of budget discussion. So to conclude, the main differences between the used and the new baby grands really are how the action ages over time, how the piano is going to perform over time because of the degradation of the soundboard crown, and, of course, you’re talking about the differences in price. And those really are the three. Have yet to meet a person who quit piano in their youth and didn’t regret it later in life. SPARTANBURG, S.C. —Generosity and talent are teaming up to make music at the Spartanburg Soup Kitchen. A week ago a couple from Spartanburg donated their baby grand piano to the soup kitchen before they moved to California. “They wanted to leave this baby grand piano with somebody that would continually play it. They didn’t want to donate it to somebody who might sell it,” said Lou Sartor, the charity’s executive director. The piano is 80 years old. “I have the original sale, was purchased back in 1935,” Sartor said. Step into the lobby of Everett Station and there she is, gracefully stroking the baby grand piano … with a paintbrush. Sure, you’ve seen lots of people playing the piano. But painting one? For the rest of July, you can catch Kimberly Williams painting the baby grand for Street Tunes, a summer tradition with public pianos throughout downtown Everett. In August, it’s your turn to have at it. You can play chopsticks or whatever tune turns you on. 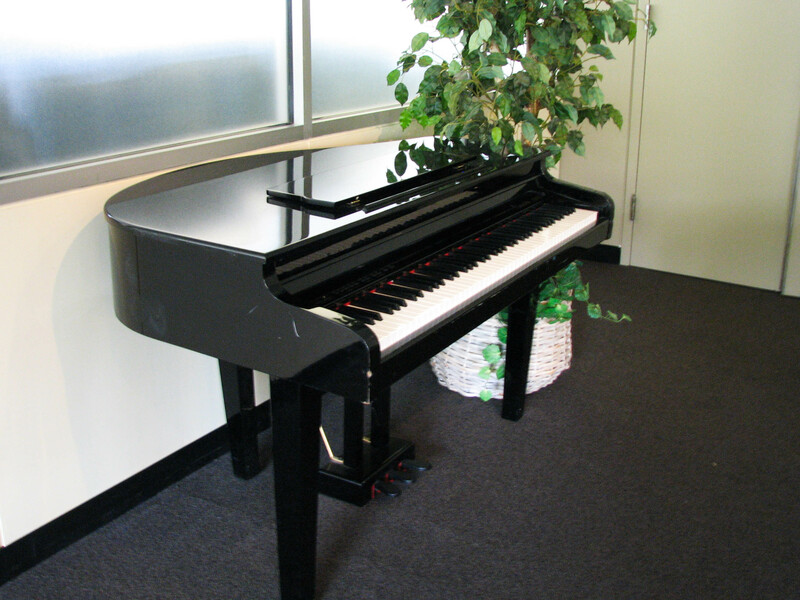 This 2001 Baldwin Baby Grand piano has been in the Sirius XM Studios and used for all of their broadcasts in the “Fishbowl.” For the past 14 years, the piano has been signed by guests of the studio. This entry was posted in Merriam Pianos, Pianos, Merriam Pianos Blog and tagged baby grand, baby grand pianos, buy new piano, buy piano, upright pianos, used piano, used pianos. Are Musicians’ Brain Waves Really Better At Syncing With The Music?